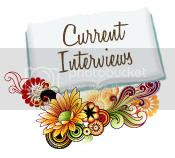 Bookshop Talk: FAVORITE HALLOWEEN BOOKS! Halloween is my favorite holiday and I’ve been collecting Halloween children’s books for eight years. 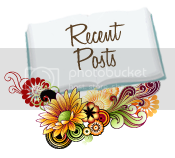 (This year, I broke out the stash on September 2 to allow a full two months’ of spooky entertainment!) All of the picture books below have fun stories and intriguing illustrations, and are entertaining even for the parent who has to read them aloud a few (dozen) times. 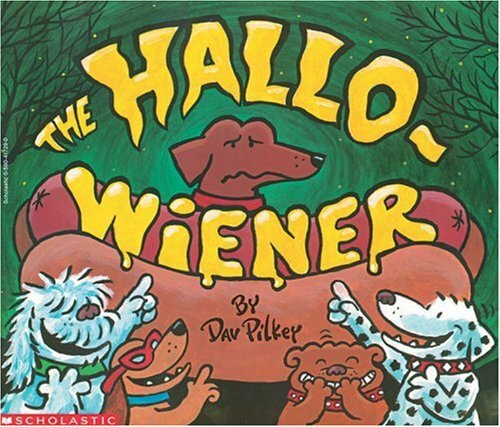 THE HALLO-WIENER, by Dav Pilkey (1995), is my all-time-favorite children’s book of any genre. I’ve bought this book for a number of friends with small children, and will soon need to replace my own bedraggled copy. 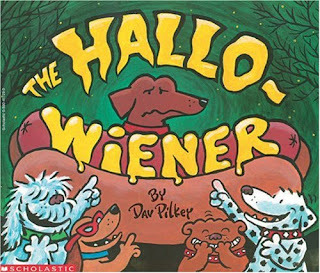 Oscar is a wiener dog who is “half-a-dog tall and one-and-a-half dogs long.” All the other dogs tease him, and the teasing gets even worse when his mom makes him a hotdog costume for Halloween. He tags along behind his friends on Halloween night, embarrassed by his costume. The other dogs are spooked by a monster—but Oscar realizes that the monster is just a couple of cats and saves the day. The illustrations have hidden treasures for adults (at obedience school one dog is writing on the blackboard, I will not sniff my neighbor). The little werewolf who lives in the tomb says goodnight to all his possessions and puts the Goon to bed. 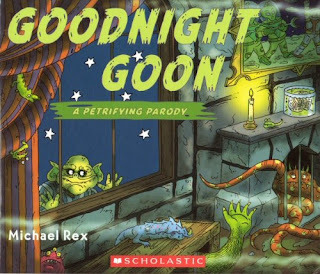 The illustrations are entertaining, showing various monsters interacting (Goon, vampire, witch, mummy, and the Martians which have escaped from their picture). Each page of WHEN A MONSTER IS BORN, written by Sean Taylor and illustrated by Nick Sharratt (2006), features two possibilities that propel the story. When a chartreuse monster sets out to seek his fortune and hides behind a restaurant, “there are two possibilities—either a kitchen-girl comes out and tips a saucepan of porridge over the monster’s head, or… the kitchen girl notices the monster and stops in her tracks.” And so on with possibilities as the girl turns into a lavender monster, they fall in love, get married, and have a little orange baby monster. 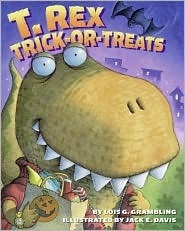 T. REX TRICK-OR-TREATS, written by Lois G. Grambling and illustrated by Jack E. Davis (2005), is a cute story for dino-loving kids. (And what kid doesn’t love dinos?) T. Rex ponders what to wear for trick-or-treating. His friends, Diplodocus, Stegosaurus and Iguanodon, convince him to go as himself because his pointy teeth are much scarier than any costume. 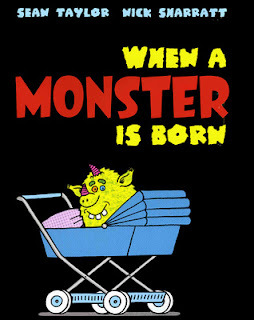 The text is fun for reading out loud because of repetitive phrases like Eeeek! and Scary! 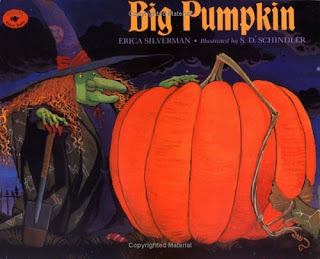 In BIG PUMPKIN, written by Erica Silverman and illustrated by S.D. Schindler (1992), a witch plants a pumpkin. Come harvest time, the pumpkin has grown much too large. One after another, a ghost, a vampire, and a mummy—each bigger and stronger than the last—offer to help but none can budge it. Finally a bat, tiny but clever, solves the problem. The witch makes pumpkin pie for her new monster friends. Do you or your kids collect Halloween books? Which are your favorites? Share in the comments section! 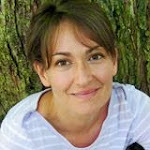 Laura, these are great Halloween book suggestions!